Lots have been talked about the ‘Gujarat Model’ – the state of Gujarat has been projected as the ‘model state’ of India. It is not being called a model state because of the spectacular natural beauty of Gujarat and its beautiful people but, it is being called a model for development. The model is essentially the model of development by big capital led industrialisation. Gujarat is considered to be the most preferred destination of big capital among the Indian states because of expected high rate of return. The Gujarat state government has played a role of ‘facilitator’ and it has created an environment, which is ‘business friendly’. The possibilities of labour strikes have been minimised, the voices of descent have been curtailed, the labour laws have been almost abolished and the big corporates have been given all kinds of clearances at a fastest rate and have been gifted with almost free land for industrialisation along with other required infrastructural facilities like water resources, electricity, roadways, etc. Lot of tax concessions are also given to the big-corporates to attract more investment into the state. But, these tax expenditures and other expenditures are direct or indirect subsidies to corporates to ensure higher rate of profit for them at the cost of not using that money from government exchequer for other purposes of human development e.g. education, health etc. The degree of labour exploitation is also more severe in Gujarat as compared to the other states in India because of the most pro-corporate stance of the state government. However, it is better to be exploited than not being exploited at all. Even if, the corporates make more profit, the unemployed gets job – may be, at a lower wage – but still gets a job. Even if, the government spends proportionately more on corporate subsidies and on other facilities to corporates and less on human development, the human development indicators are expected to improve because of relatively higher rate of employment. Therefore, the benefit is claimed to be more than the opportunity cost in this so-called ‘Gujarat model’. For logical consistency, then, Gujarat being the number one among the Indian states in attracting big industries, should have been number one vis-à-vis human development indicators, too. But, it seems that the State of Gujarat is at most an average state with respect to the human development indicators. What is more important is that it was an average state before 2001 also – Gujarat’s performance is actually below average vis-à-vis the improvements (i.e. the change) in human development indicators. Let us look at the data. If we look at the census data of 2011, with respect to percentage of households with access to electricity, safe drinking water and sanitation, we see that Gujarat ranks 13th among 35 states and union territories in India. This ranking of Gujarat was 9th in 2001. If we consider percentage households without access to neither electricity, nor safe drinking water nor sanitation, we see that the rank of Gujarat was 17th out of 35 states & UTs in 2011, which was 12th in 2001. Following Tendulkar committee poverty estimates, according to national sample survey large rounds, the rank of Gujarat with respect to percentage of population below poverty line was 16th out of 30 states in India during 2011-12 and it was more or less the same rank during 2004-05 and 1993-94. During 2009-10, the consumption-based inequality in Gujarat was 14th from top out of 35 states & UTs in India, which was 10th highest in 2004-05. The most important two areas of human development are education and health. According to the 2011 census data, Gujarat stands 18th among the 35 Indian states & UTs with respect to the literacy rate. If we look at the budget estimates of 2012-13, the government expenditure on education as percentage of aggregate government expenditure has been one of the lowest in the country – it has been only 13.4% in Gujarat as compared to the all states average of 16.5% (Source: http://mla.prsindia.org/sites/default/files/policy_guide/State%20wise%20spend%20on%20education_0.pdf as seen on 29/04/2014). Only four states from North-East namely Arunachal Pradesh, Manipur, Nagaland and Sikkim and Jammu & Kashmir spend proportionately less on education than Gujarat. This shows that the Gujarat state government prioritises education less than most of the states in India. The rank of Gujarat vis-à-vis infant mortality rate among 35 states & UTs was 25th during 2011. Gujarat is ahead of Andhra Pradesh, Assam, Bihar, Chhattisgarh, Haryana, Madhya Pradesh, Odisha, Rajasthan and Uttar Pradesh vis-a-vis infant mortality rate but, it is behind all other states in India. The economic survey 2012-13 tells us that among 15 major states (for which data is available), Gujarat ranks 8th vis-à-vis year of life expectancy at birth during 2006-10. As far as the average annual per capita health expenditures by state governments during 2006-07, 2007-08 and 2008-09 are concerned, among 30 Indian states, Gujarat ranks 8th from below (Source: Calculated from National Institute of Public Finance & Policy study by Mita Choudhury & H K Amar Nath - as seen on 29/04/2014 - available at http://www.nipfp.org.in/media/medialibrary/2013/08/health_estimates_report.pdf ). Gujarat is ahead of UP, WB, Chhattisgarh, Jharkhand, Odisha, MP and Bihar and behind all other states in India. It is clear that the state government of Gujarat does not prioritise government expenditure on health and education as compared to most of the states in India. Therefore, it is commonsensical to understand that the standard of life of people in Gujarat is pretty average (if not below the all States’ average) in terms of access to basic facilities like water supply electricity and sanitation, in terms of poverty and inequality and also in terms of education and health indicators. More importantly, there is no sign of improvement of Gujarat’s rank in terms of various human development indicators during the last decade. The social sector spending is relatively less prioritised by the state government of Gujarat as compared to most of the Indian states. An independent study by Rajeev Malhotra of O.P.Jindal Global University titled ‘India Public Policy Report 2014: Tracking Poverty, Hunger and Malnutrition’ (Oxford University Press) has ranked the Indian states on the basis of rule of law index, physical infrastructure development index, livelihood opportunity index and social opportunity index. Gujarat ranked 24th out of 35 states and UTs in 2011 and Gujarat’s rank was 17th in 2001 – there has been a deterioration. Certainly, it cannot be called a ‘model state’. But, still Gujarat is being projected as the model state. Is it simply because of the fact that Gujarat chief minister (since 2001) Shri Narendra Modiji has become the prime ministerial candidate of BJP? Or, there is something more about this ‘Gujarat Model’? In 2001-02, the share of wages in net value of added (i.e. net value of output) was 19% in organised manufacturing sector in India and the share of profit in net value added used to be 24%. 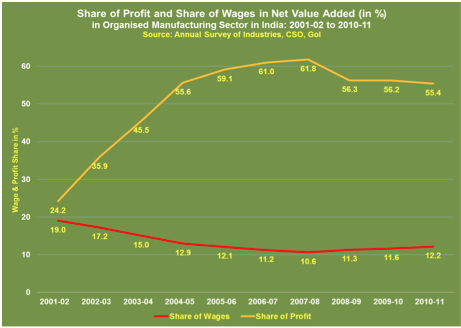 Within a time span of only 6 years, by 2007-08, the share of wages came down to 10.5% and the share of profit went upto 62% of net value added for organised manufacturing sector as a whole as per the annual survey of Industry (ASI) data. According to the latest data of 2010-11, the share of wages still remains low at 12% of net value added and the share of profit remains more than 55% of net value added. During this profit boom, Gujarat could attract maximum investment and it has become the most preferred destination of private investment in India. The expected rate of return from investment in Gujarat must have been greater than or equal to expected return for the country as a whole. Reportedly, one businessman GautamAdani has seen the value of his stock holdings going up from Rs.6 crore in 2001 to Rs.84,000 crore in 2014 (Source: The Statesman of 19/04/2014 available at http://www.thestatesman.net/news/50261-modi-s-rs-84-000-crore-man.html?page=1 as seen on 30/04/2014). The degree of labour exploitation also must have been higher in Gujarat and corporate tax concessions and other infrastructural facilities for the industries must also have been provided from the government exchequer (tax payers’ money) more in Gujarat as compared to the other states. Even this is not all about ‘Gujarat Model’. 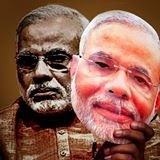 Even after no improvement in quality of life of people on an average, even after huge corporate exploitation and corporate facilitation at an unprecedented rate, there is no significant anti-incumbency wave against the Modi-government in Gujarat till date. The voices of descent might have been managed well by using communal polarisation so that the corporate loot can go on smoothly in a happy ‘investor friendly business environment’. This is the real Gujarat model.